This week, we have Natalie! She is currently a student and she is definitely one of the bloggers whose posts I look forward to. Aside from posting reviews, she does FOTDs quite often and is adventurous with her makeup—something I certainly wasn’t when I was still in school. You can check out her blog here. This is natural makeup for me. It’s definitely not a no-makeup makeup look—you can see colour, but it’s nothing overwhelming. I believe makeup should be fun, and should be something that you play with. I like the way it can change an entire look or outfit. Your makeup is your most powerful and versatile accessory – it’s easy to change up a look with just a different lipstick, or using the same quad of eyeshadows differently. I also like to think I’m defying social conventions with my makeup, and just defying social expectations, in my own small way. Most people—boys especially I find—think that makeup should never be seen, if you have to apply it at all. I’m comfortable enough going out barefaced, so when I use makeup, I don’t believe in using it to ‘hide’ imperfections, but to make my outfit more fun. I love looking at runway looks and trying to figure out how to translate them into something more wearable. I also love to have colour—lots of it. 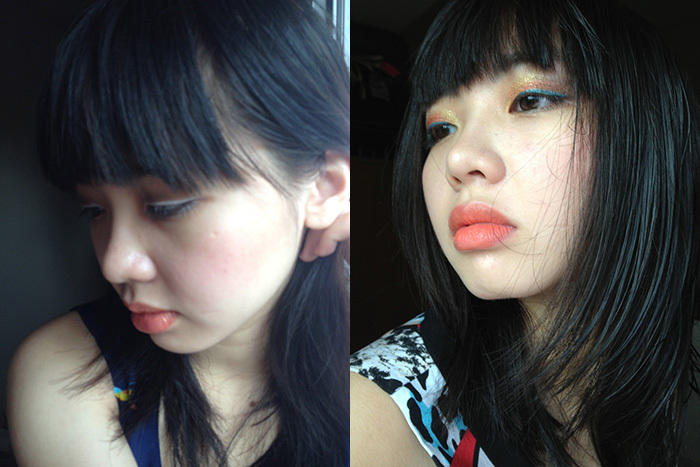 Examples of my slightly unconventional makeup. On the left, I used white eyeliner on my upper lashline rather than my waterline. On the right, I’ve used golds and brown and eyeshadows, then I used a blue eyeliner to make the bronzes pop. 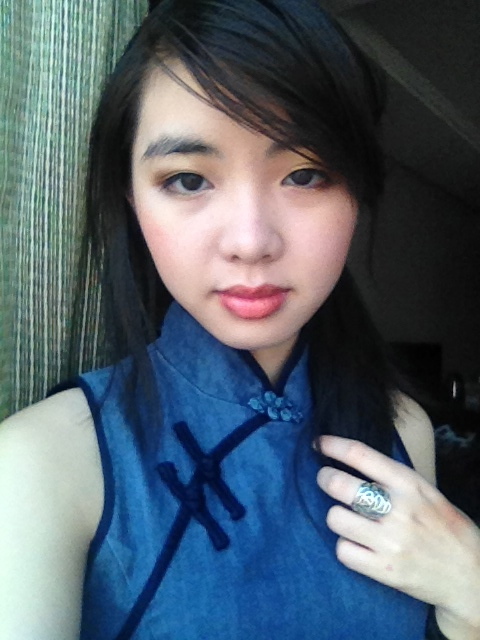 You’d notice in the photos below that I don’t carry eyeshadows or blushes with me. I’m of the belief that if my eyeshadow or blush doesn’t last throughout the day with the help of a primer, it’s useless. I started with theatrical makeup (probably how my love for colourful makeup started) and we always used highly pigmented MAC eyeshadows. I don’t have any patience with powdery and poorly pigmented products. Most of my favourite items are from Urban Decay and MAC for this reason. Trick to making your makeup last longer—use a good base. I have MAC Bare Study and MAC Eye Prep + Prime here. I have Kiehl’s Blemish Control Daily Skin-Clearing Treatment and Kiehl’s Blue Herbal Moisturizer on the top, which I massage into my face about five minutes before starting on makeup. I don’t use a face primer unless I’m going on stage, because I don’t like the way silicon clogs up the pores. Also, wearing a primer on top of a moisturizer usually means the two products slide off each other and it’ll just make your face feel greasy. 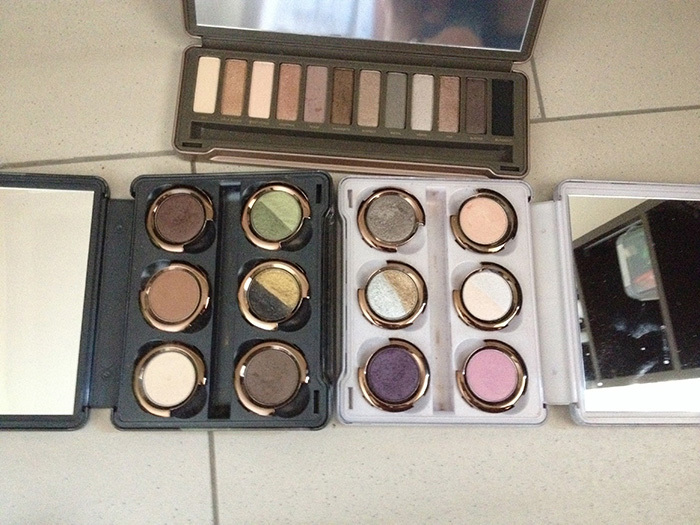 My staple eyeshadows—all of them from Urban Decay. In a clockwise direction, I have the Naked 2 palette, the limited edition Glinda palette and Theodora palette, which was a tie-up with Disney’s Oz: The Great and Powerful movie, released this year. I’ve only started to use concealer recently (damn you university life). I have the Catrice concealer palette a friend of mine was kind enough to buy for me for my birthday. 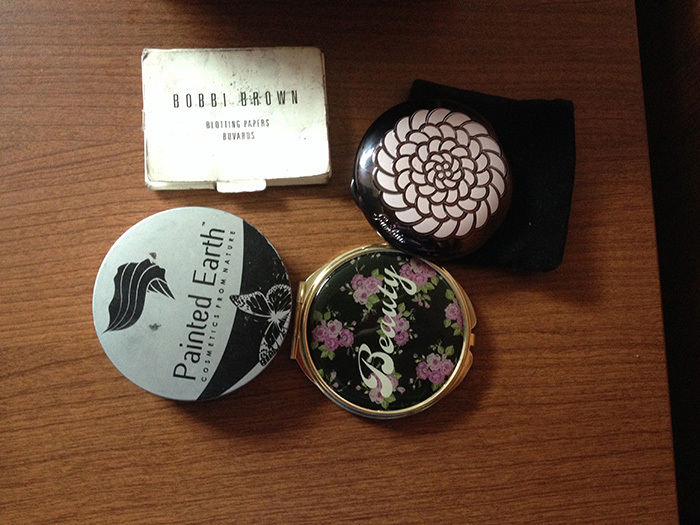 In the photo I also have my staple blushes. I believe everyone should own a blush in these shades; brown, pink and coral. You don’t need anything else, really. 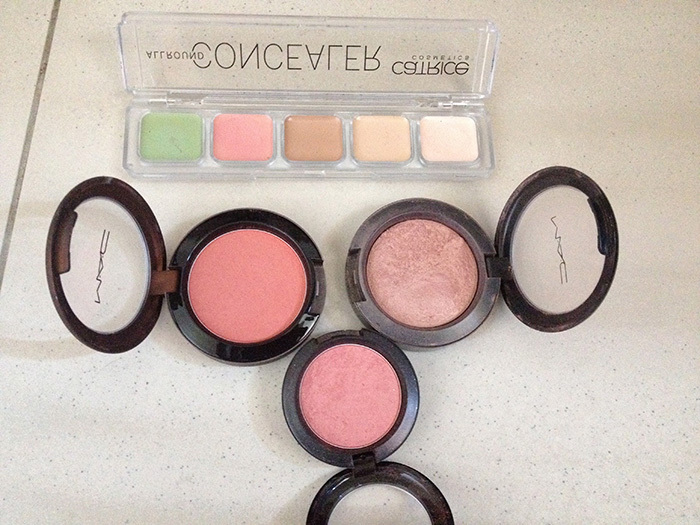 In a clockwise direction, I have MAC Warm Soul for whenever I want some colour on my cheeks but I’m not sure exactly what (it goes with everything I swear), MAC Born to Love whenever I want a pinker, more saccharine look and MAC Ripe for Love when I’m wearing coppers and bronzes. 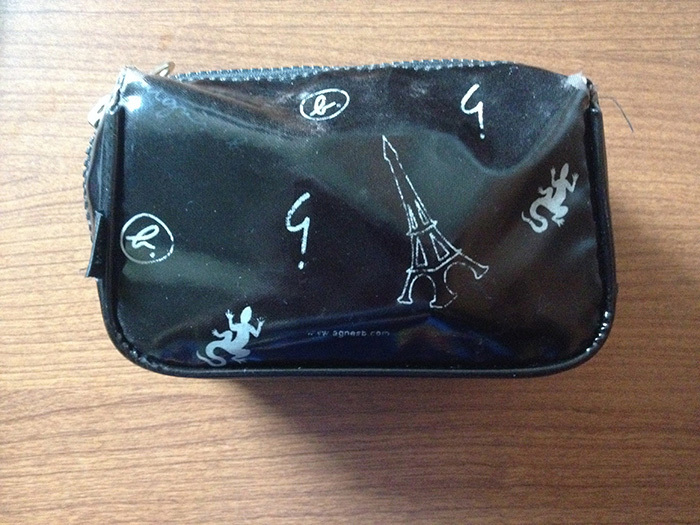 This is the makeup bag I carry around with me everywhere. I think it was a free pouch my mom got from Agnes B. I’ve used it for ages and it’s gotten pretty worn out. I keep meaning to replace it, but I haven’t been able to find another pouch at such a handy size. 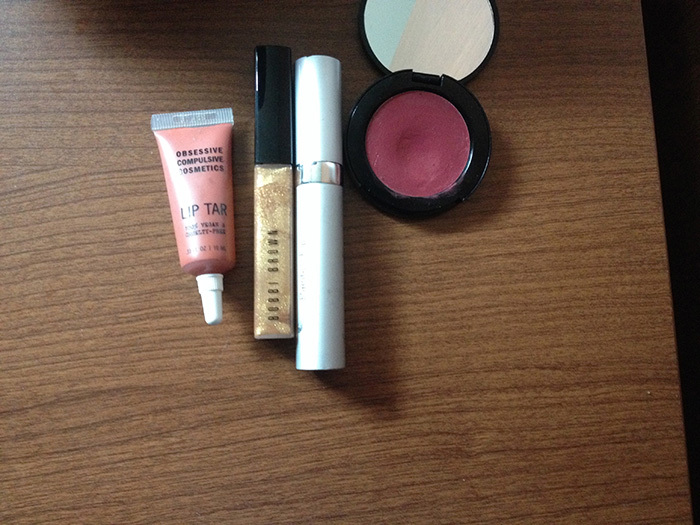 These are the items I always have inside my makeup bag. I always keep a packet of blotting paper (why I decided to buy overpriced blotting paper from Bobbi Brown is a long story, but it’s lasted me a long time now), a Painted Earth Luminous Coconut Oil Pressed Mineral Foundation (which is the my go-to powder foundation), a compact mirror from Forever21, and my compact of Guerlain Meteorites Illuminating and Mattifying Pressed Powder Compact in Teint Beige, which is my favourite finishing powder. It makes my skin feel velvety smooth, has a lovely scent, mattifies my skin and always creates a subtle glowy finish that I find no other product can replicate (Hourglass Ambient Lighting Powders come close though). 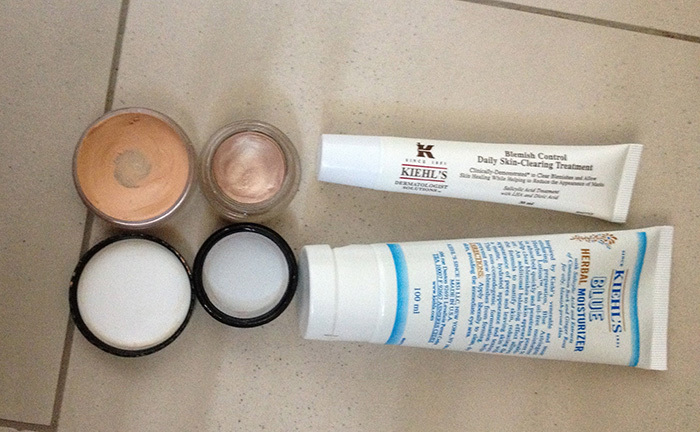 Here are other products that I usually swap around, but I will carry in some form or another. Lip balm (Korres Lip Butter in Mango here, which does amazing things for my dry lips), a pencil sharpener (I love my Urban Decay Grindhouse), a powder brush for touching up foundation (I’ve got my pink Kabuki brush from Painted Earth Skincare), a travel-sized vial of perfume (here I’ve got Anna Sui’s Fairy Dance, which I love), disposable eyedrops for when my contacts dry out and whatever eyeliner I happen to be wearing that day. (Here I’ve got Maybelline Hypersharp Liquid Liner and MAC Photogravure). 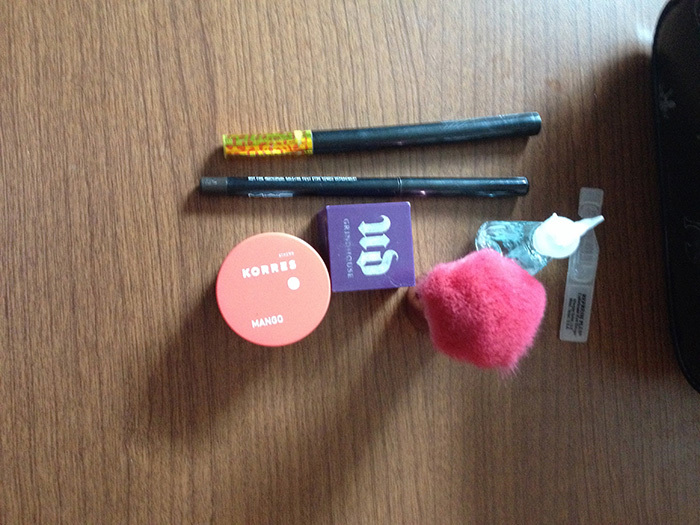 And these again, are products I usually switch around but will have in some form in my palette. A lipstick or lip tar (I have OCC Clockwork here), a lipgloss (Bobbi Brown Canary High Shimmer Lipgloss, which is a dazzling mess of gold sparkles) a mascara (Painted Earth Supercurl mascara) and my Bobbi Brown Raspberry Pot Rouge, which I carry out of habit more than anything as I used to use it all the time. Thank you for sharing a bit of your makeup life with us, Natalie. 🙂 I hope you all enjoyed this return to (hopefully) regular posting. For more Nosy Beauty, click here. Oh dear, Nat, you fit sooo much stuff in there! And it’s a really compact bag too! I shall be very sad if it were to break down one day. ❤ :D! Thank you for indulging me & my request! 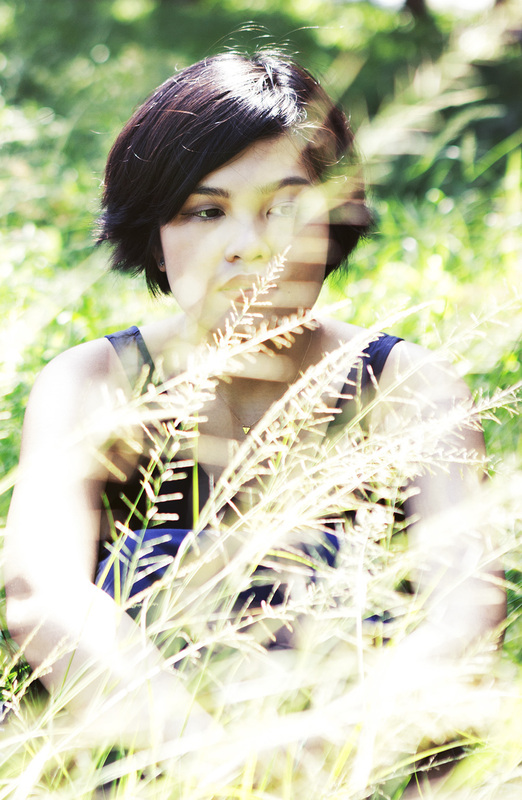 I’ve been featured on Carina’s blog! Have a look, and do be sure to check out her posts! I always look forward to seeing her swatches and reviews, and she has a ton of interesting features.